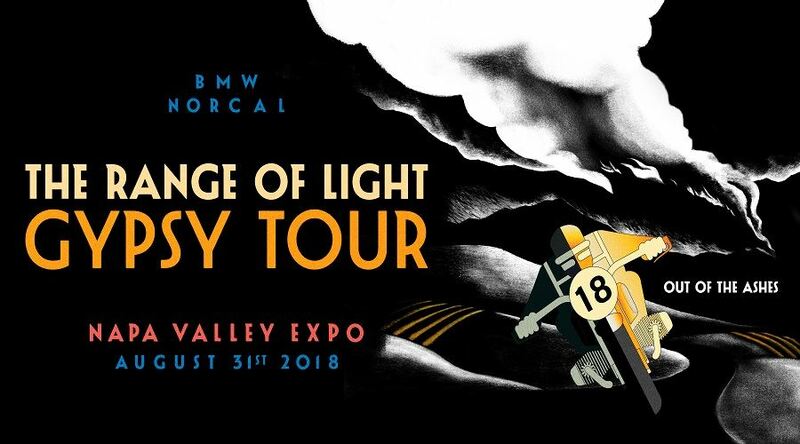 BMW Motorcycle Club of Northern California - 2018 RANGE OF LIGHT GYPSY TOUR! 2018 RANGE OF LIGHT GYPSY TOUR! temperatures are looking great for this year! That's right, it's time again for the 28th Annual BMW NorCal Range of Light Gypsy Tour, a rally like no other! Why? Because this is no stationary rally. This is a riding rally, a two day event conceived for true riding fans, by true riding fans. Riders will be treated to exceptional road and optional GS routes, showcasing some of the best riding and scenery in the West. And be sure to bring fresh tires as you can expect between 300-400 miles each day. Our destination? You won't know until the day before. This is a closely guarded secret - all we can tell you is the start point. Two days of awesome riding, destinations unknown. Shared Rever route files/downloadable .gpx files. The Range of Light Gypsy Tour is part adventure, part test piece, part endurance event, part riding tour, part camp-out, and 100% fun. So register now and join those ready for the best rally in the West! This year we start at The Napa Valley Expo, in Napa, CA. And as with all BMW NorCal events, riders of all brands of motorcycles are welcome to ride in the ROL, as long as the bikes are street legal.